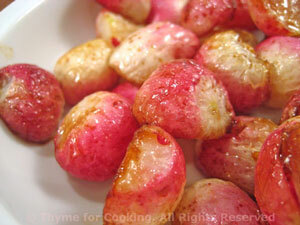 Roasted Radishes, easy, flavorful, Thyme for Cooking spring vegetables. Radishes are a root vegetable, so it's only logical that they can be cooked. They soften, lose the heat and get a bit sweet. Radish leaves are good in salads and omelets, too. Mine were the round, red and white variety. Trim radishes but leave whole. Toss with olive oil and put in a roasted dish just large enough to hold them easily.